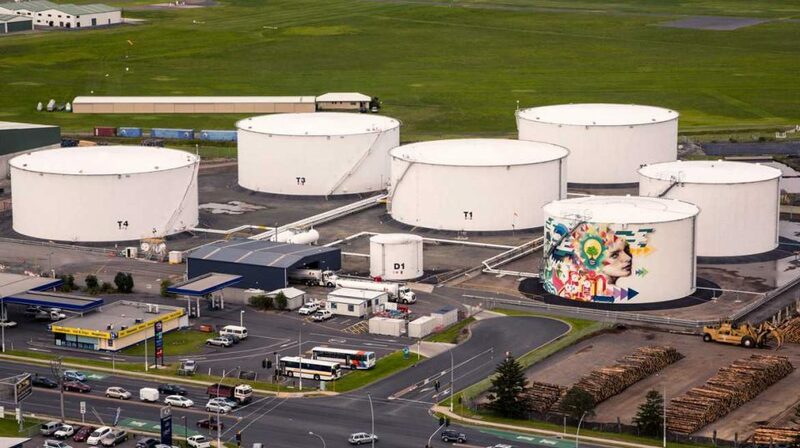 Fuel me once, shame on you, fuel me twice and you’ll have to paint these huge storage tanks. You can bet the farm these creative tanks will fuel everybody. 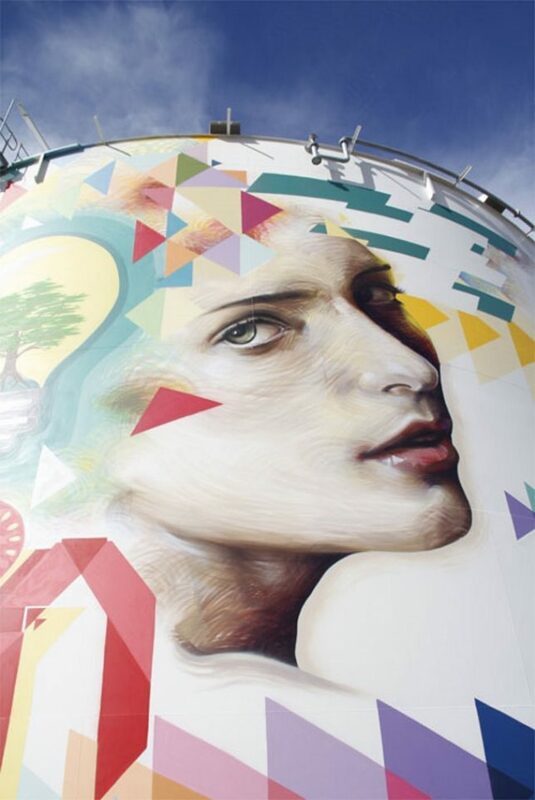 The enormous fuel storage tanks populating the world’s many tank farms are usually painted, though not creatively. White is the preferred color: you don’t want a tank filled with huge quantities of flammable fuel to heat up on sunny summer days. 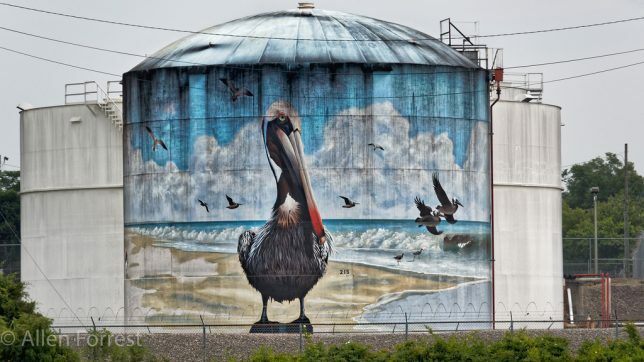 Canvases so big and blank are tempting templates for artists, however, and a single artistically tinted tank can transform the mood of an entire tank farm. Take this 10.6 million liter capacity tank at Terminal NZ’s Mount Maunganui storage facility at the Port of Tauranga, spectacularly photographed by Flickr member Paul Oellermann (Paulos75) in July of 2013. 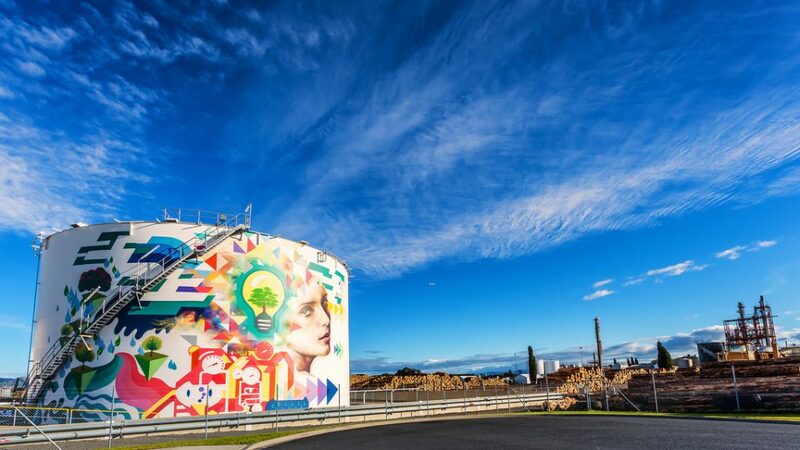 The tank was painted by Cut Collective, an Auckland-based commercial art studio. The 15m (50ft) tall by 30m (100ft) wide mural took four days and nights to complete and required over 200 spray cans of paint. The mural’s theme “represents youth and the idea of energy” according to Ross Liew of Cut Collective. Flyover country just got a lot happier, though California isn’t exactly in “flyover” territory unless you happen to be, er, flying over it. 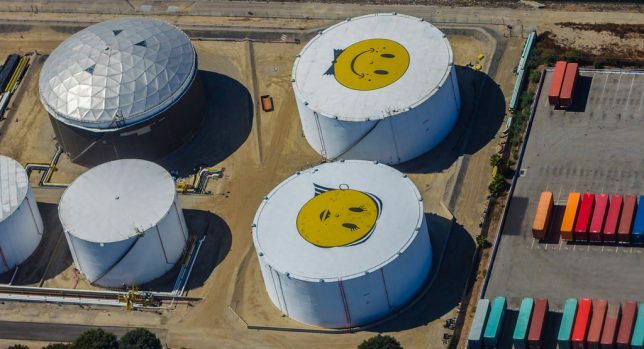 The point (and we do have one) is that someone, some when, for some reason decided it would be a good idea to paint his & hers smiley faces atop two fuel storage tanks at a tank farm situated between Long Beach and Torrance airport. Another question… why is the male smiley grinning so widely while his lady companion appears much more reserved? Flickr member Rosanne James (rosanne_j) snapped the pie-faced pair – from the air, obviously – in the fall of 2011. According to Flickr member and photographer Allen Forrest (AL904), tour boats ply the Cape Fear river near Wilmington, North Carolina. 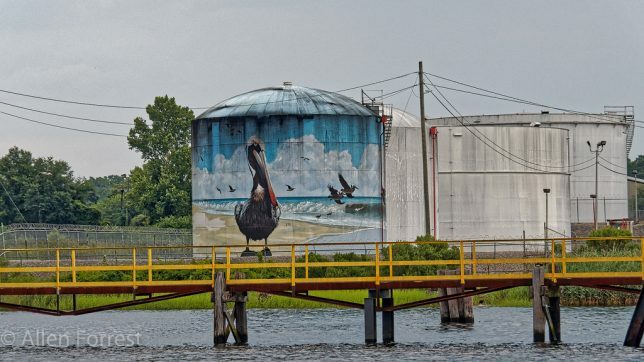 We’re not sure how visually appealing such a tour would be, though at least the view improved once this fuel storage tank was painted with a beachfront scene of pelicans at play. Forrest captured the scene in June of 2016.